What Do You Use Torrents For? By download and starting a torrent, you’re opting to use the P2P (peer-to-peer) protocol for file sharing. Users can host and share their torrents so other users can download from the original host’s connection, then in turn become a secondary host, known as a seeder. Usually the more seeders there are, the faster the download speed. It isn’t required to seed, but it’s highly recommend to use a VPN or proxy for using torrents. In this article we’ll discuss the differences between a proxy vs VPN. Using a VPN or proxy to download or upload torrents will mask your connection to prevent ISPs or other organizations from tracking your actions. This adds an extra layer of network security and leaves unused ports closed. P2P connections can be manipulated by advanced hacked, but using a VPN or proxy can avoid malicious network connections. 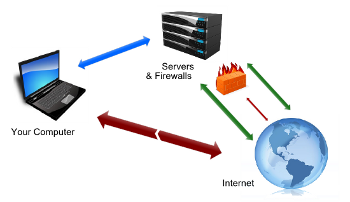 Using a proxy can secure some web and torrent traffic, but using a virtual private network will ensure full security. Advanced users usually use third-party clients to utilize and enhance proxies and VPNs for torrent sharing. Overall, we recommend using VPNs for downloading torrents securely. Proxies are meant for web traffic and won’t offer the same solid features as a VPN. Many VPN providers don’t log either, so you won’t ever have to worry about getting in unnecessary trouble.